All proceeds from the book sales are directed to Lauren's First and Goal Foundation to support its mission to provide financial support for brain tumor research and cancer services, to offer financial and emotional support to families living with pediatric cancer, and to increase awareness of the disease. 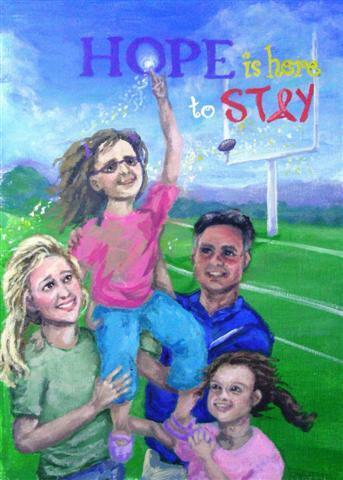 Hope Is Here To Stay can be purchased online at www.amazon.com and at www.booksurge.com. In addition, a hardcover edition was recently released and is available via phone from Book Surge at 866-308-3265, ext. 5692. For more information, discounted bulk orders or to contact the author, please email the author, Patrice Domozych, directly at docdomo@optonline.net. Patrice is also available for school visits to speak with students about the writing process. More information about her presentations is in the brochure below. You can also read comments from school officials, teachers and parents that have participated in a visit. Manual of Football Drills and Skills is designed to provide coaching ideas from the best in the profession while increasing awareness of pediatric brain tumors and raising funds to help find a cure. All of the material, including drills for game-management, strength and conditioning, offense, defense and special teams, was contributed by volunteer coaches from Division I, II and III and the professional ranks.